ATHANASIUS TELLS US that Antony, locked in his cell, repeatedly battled noisy, foul-smelling demons that took the shapes of lions, bears, leopards, bulls, serpents, asps, scorpions, and wolves. Many visitors approaching Antony’s fortress reported hearing sounds of riotous crowds inside, wailing, shrieking, and crying, “Get out of our domain! What business have you in the desert? "—which they later surmised was the noise of demons. To begin with, we need to understand the genre in which we find such stories. Athanasius’s Life of Antony, for example, which became a model for saints’ lives, is not a modern history or biography; rather it is a panegyric, a form of eulogistic praise common in ancient pagan literature. Panegyrics of ancient pagan prophets and philosophers routinely included miraculous tales that raised them to the status of superstars. In early Christian circles, we find many second- and third- century apocryphal Acts of the apostles that followed these rhetorical forms, creating a fictional romance literature that embellished the historical lives of Jesus’ earliest disciples with flashy miracles (in the Acts of Paul, for example, Paul baptizes a lion, and when Paul is beheaded, milk spurts from his neck). Most of the stories of the desert monks followed these pagan models. More important than the genre, though, is the setting. The very word “pagan,” meaning “rural” or “from the countryside,” came to be used of the heathen customs, beliefs, and practices that still lingered in rural areas. 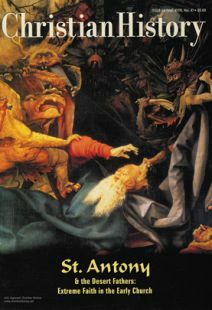 As Christianity consolidated its position in the cities, many believed demons were forced to flee to the desert. So Antony and other monks went to the desert to do battle, much as Christ had gone into the desert and was “tempted by Satan, and was with the wild beasts” (Mark 1:13). Diana Severance is an adviser for Christian History.